Kindergarten to third-grade students at Blessed Trinity School in Richfield showed their support for Catholic schools during the ACE bus tour’s stop there April 3. The Alliance for Catholic Education, a program of the University of Notre Dame, is celebrating its 20th anniversary with a cross-country bus tour making stops at 50 schools along the way. 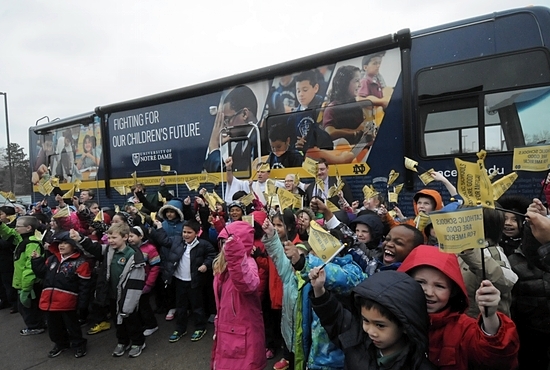 The Fighting for Our Children’s Future National Bus Tour included stops at two schools in the archdiocese, Blessed Trinity in Richfield and Good Shepherd in Golden Valley. 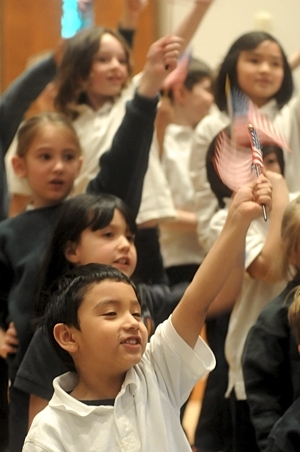 The kindergarten through third-grade students at Blessed Trinity performed a patriotic song as part of the program after Mass. In the foreground is Edwin Portillo; visible behind him are classmates Cassidy Gaston and Lila Martin as well as second-graders Ally Pellegrini and Theresa Nguyen. ACE offers academic, experiential, and personal formation to people aspiring to be teachers who are ready to serve where they are needed. “We’re celebrating the great gift of Catholic schools and the incredible work that the teachers, families, benefactors and students are doing to create these wonderful communities of faith, hope and love,” said Alec Torigian, a member of the ACE Service Through Teaching Team. Torigian had another reason to celebrate during the tour’s stop at Good Shepherd School. He attended the school through sixth-grade and his sister, Stacie Settergren, is a teacher there. The unpublicized stop was a surprise for her birthday and also a chance for him to visit some of his former teachers and talk to the students about what he is doing on the bus tour, he said. Blessed Trinity school is celebrating 20 years, too. The school marked the tour’s stop with a Mass and program that included a student speaker and songs performed by the younger students, in kindergarten through third grade. ACE co-founder Father Sean McGraw conclebrated the Mass. 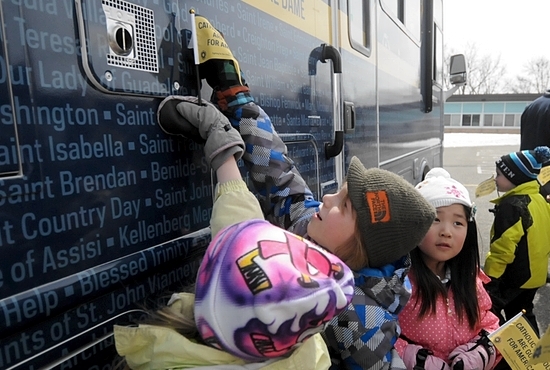 Kindergarteners Dorothy Benham, Xavier Wendt and Vivian Li point out the name of their school among the names of all of the Catholic schools in the country printed on the bus during an unscheduled tour stop at Good Shepherd School in Golden Valley April 2. “We are proud to share in the fight for our children’s future as we support the formation of the future leaders in our church and world,” he said.